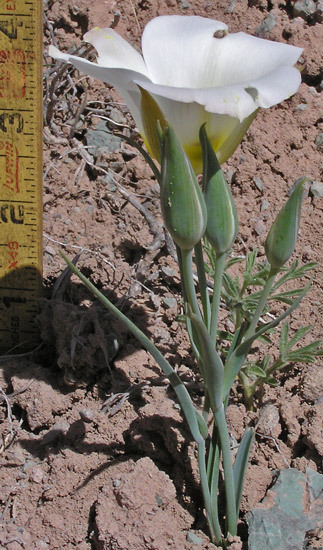 On May 17, 1806, near what is today Kamiah, Idaho, Meriwether Lewis collected the first plant of the Calochortus genus, Calochortus elegans, named by Frederick Pursh. "Calochortus", from the Greek "kalos", means "beautiful", and "chortos" means "grass", referring to the grass-like leaves. "Mariposa" is Spanish for "Butterfly" and "Sego" is a Shoshonean word for "edible bulb". 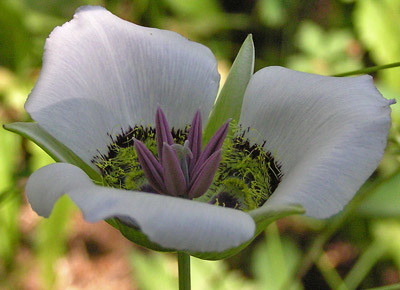 With their grass-like leaves and stem and their exotic flowers, the various species of Calochortus are favorites among many wildflower enthusiasts. 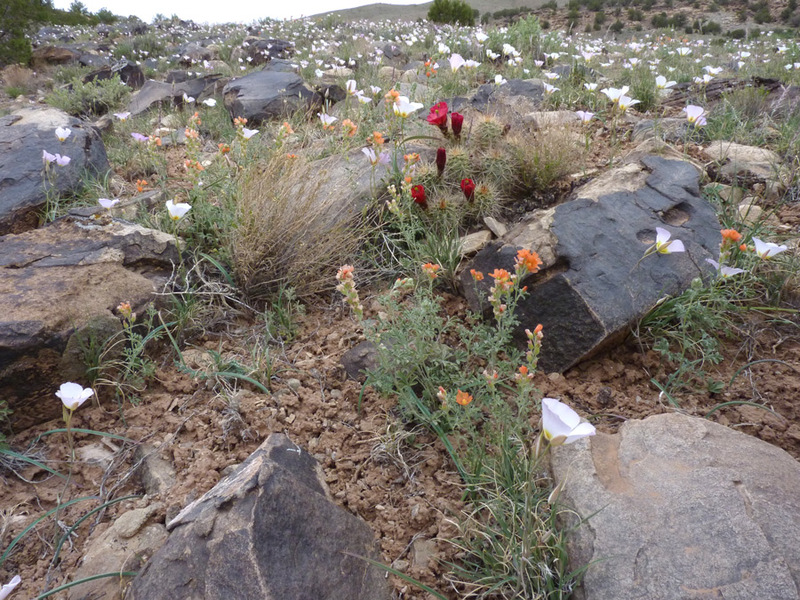 The three species of Calochortus (C. gunnisonii, C. flexuosus, and C. nuttallii) that grow in the Four Corners area are most easily distinguished from one another by the elevation they grow at, the colors and hairiness of the interior of the petals, the color of the petals, and the overall shape of the plant. 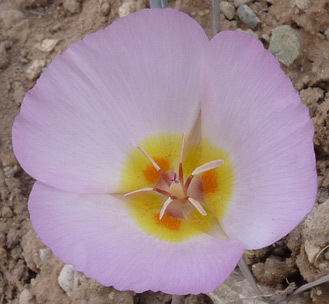 The first Calochortus flexuosus were collected by Ms. E. P. Thompson in 1872 in "southern Utah and Northern Arizona" near Kanab, Utah. The species was named and described by Sereno Watson in 1873. 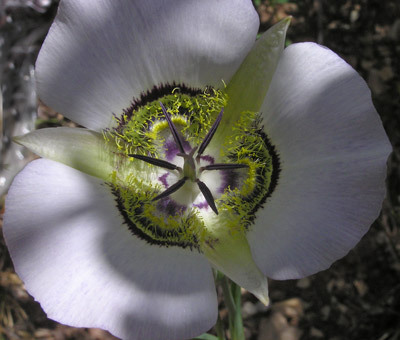 Calochortus gunnisonii was first collected in central Colorado in 1853 by Frederick Creutzfeldt, the botanist on the 19th century northern route railroad expedition, the fatal Gunnison Expedition. Sereno Watson named and described this species in 1871. 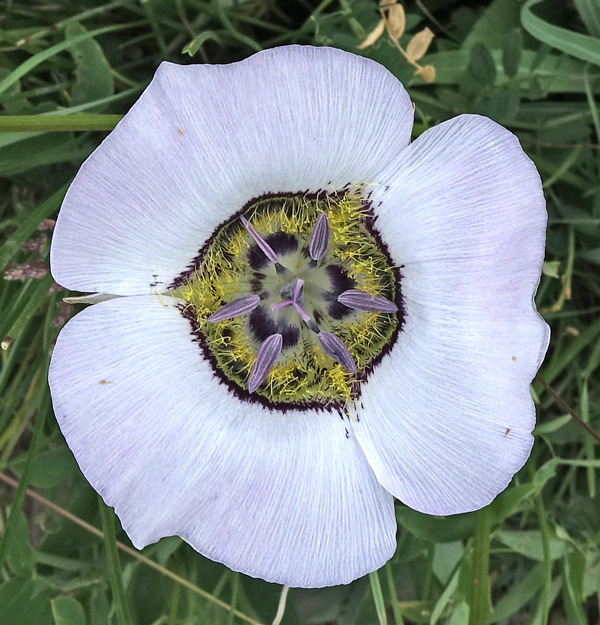 The first Calochortus nuttallii was collected near the Tetons by Wyeth on his return home from his first western expedition in 1833. 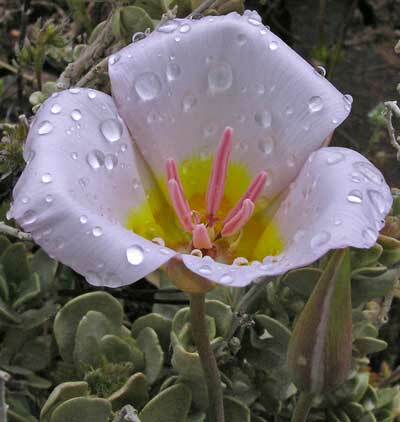 The plant was at first named Calochortus luteus by Nuttall in 1834 but it was renamed Calochortus nuttallii by Torrey and Gray in 1854.
a few place them in Calochortaceae (Sego Lily Family). 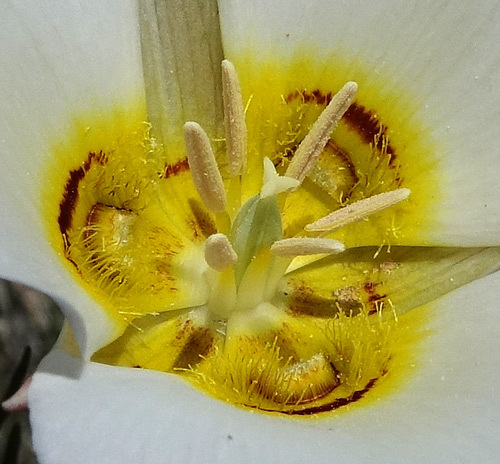 Calochortus flexuosus is one of three lovely members of this genus that are abundant in the Four Corners area. 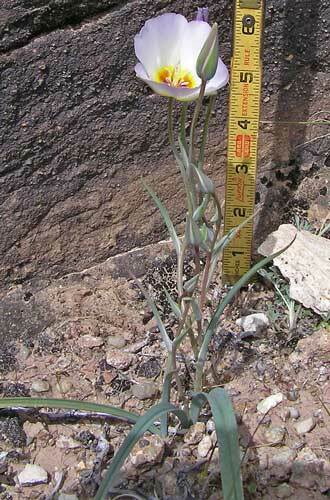 Calochortus flexuosus grows in the hot, dry areas of the lower elevations of the Four Corners. Its lovely petals, which range from white to pink to light lavender, have a low band of yellow on their interior surfaces. Stems flex and bend and leaves are wide and often have a distinctive curl. Leaves may be present at flowering time or may have already withered. Seed capsules are three winged. Canyons of the Ancients National Monument, April 5, 2005. Calochortus flexuosus shows beauty in bud as well as in flower. Flower color ranges from white to shades of light violet to pink. 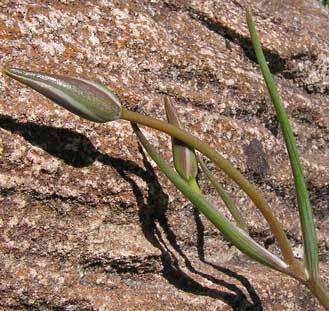 The photograph below shows the flexible stem which gives rise to the specific epithet, "flexuosus". The photograph also shows a common occurrence with C. flexuosus; the tip of a basal leaf has been nibbled off by some critter. 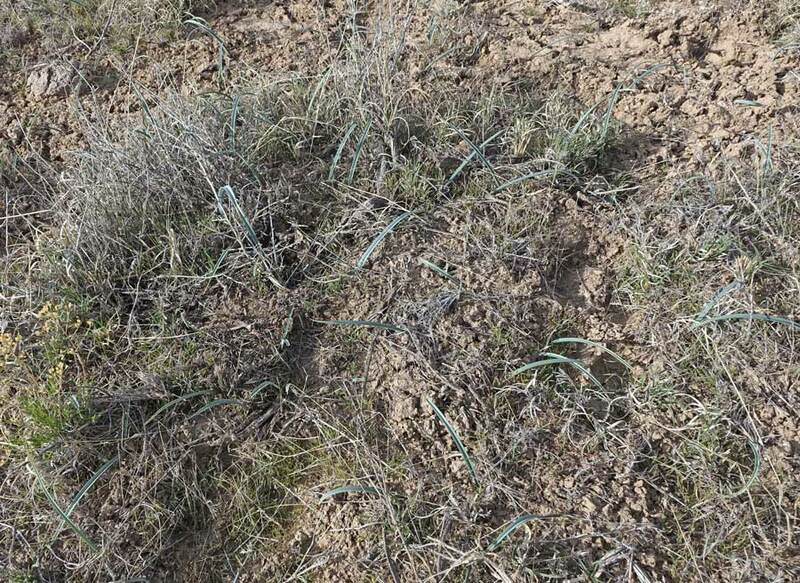 in a few square feet of a field in lower Cross Canyon, Utah, in late March. 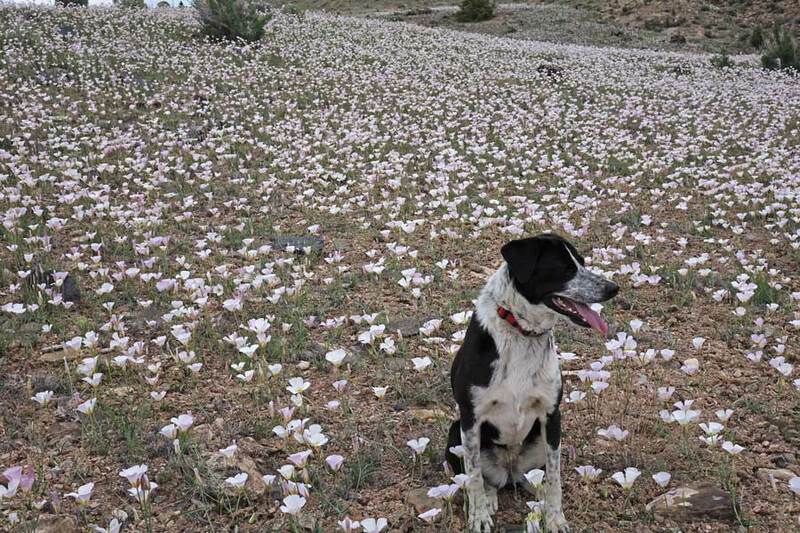 show Calochortus flexuosus blooming in the same area by the thousands one month later. Foothills, montane, subalpine. Meadows. Spring, summer. Left: Linnaeus Mountain Trail, July 16 (photographs 1 & 3) and Spring Creek Trail, July 10, 2007, Abajo Mountains, Utah. Below: Navajo Lake Trail, July 31, 2015. 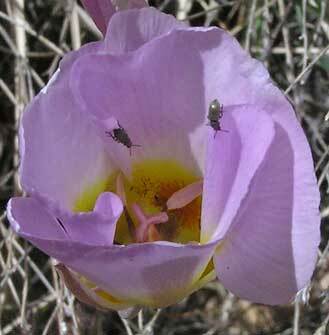 Look for Calochortus gunnisonii from low foothills to high mountain meadows. Its broad band of yellow hairs above an elliptically shaped glandular structure on each petal distinguish it from C. flexuosus and C. nuttallii. It can be sparsely scattered or in extensive colonies. 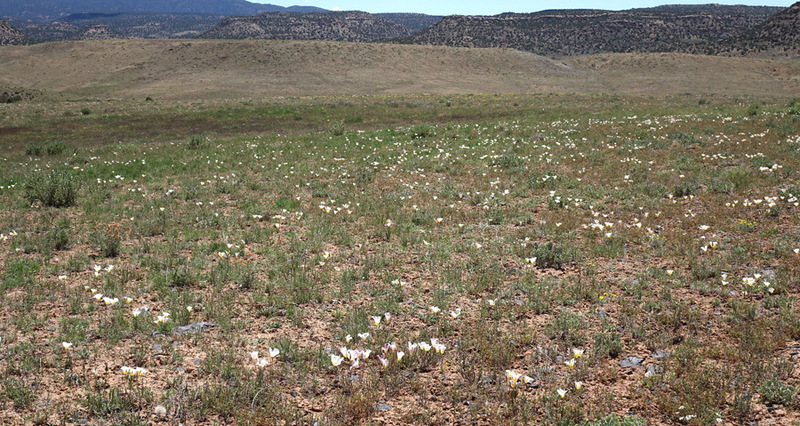 In 2003 Calochortus gunnisonii had a massive flowering in the Four Corners area: the low slopes of Mesa Verde National Park were dotted with thousands of these lovely plants. Color is most often white, but the flower can have tinges of blue and pink. Semi-desert, foothills. Shrublands, woodlands, openings. Spring, summer. Canyons of the Ancients National Monument, June 12, 2005 and Lone Mesa State Park, July 3, 2011. Calochortus nuttallii inhabits an altitudinal range between and overlapping the ranges of C. gunnisonii and C. flexuosus. As the bottom photograph indicates, C. nuttallii can be similar to C. flexuosus and C. gunnisonii in putting on quite a display of hundreds, even thousands of plants in a small area. Petals of C. nuttallii are usually white but can be pink to lavender. Thomas Nuttall was a 19th century acclaimed plant collector, Harvard teacher, naturalist, and explorer. 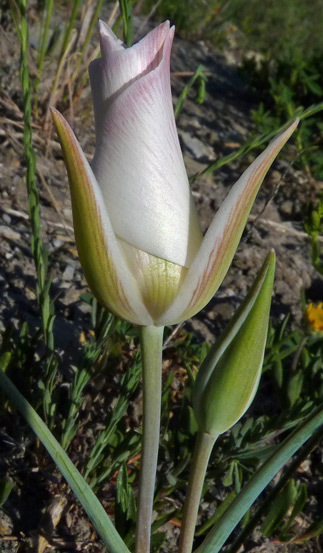 Nuttall described this Calochortus in 1834 and named it Calochortus luteus after it was discovered by his friend Nathaniel Wyeth in 1833, probably in the vicinity of the Tetons. Nuttall's description says, "flower... apparently sulfur yellow", so we can assume that the specimen that Wyeth brought back was degraded, for C. nuttallii has white flowers, although the base of the petals is often yellow. 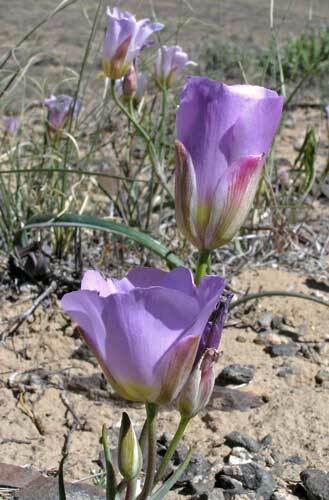 The name, "Calochortus luteus", had been used in 1833 by David Douglas, but Nuttall must not have been aware of Douglas' plant. 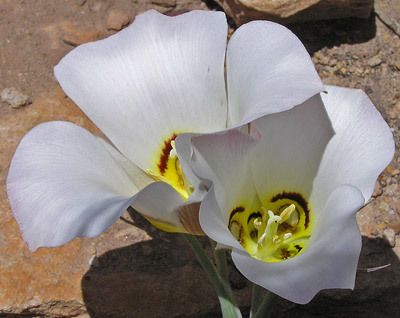 Douglas' plant retained the name of C. luteus and Wyeth's plant was renamed Calochortus nuttallii in 1855 by Torrey and Gray. I don't know why Torrey and Gray did not name the plant C. wyethia. Dolores Canyon Overlook Trail, June 19, 2008. Below: McElmo Canyon, May 17, 2015. C. nuttallii is distinguished from C. gunnisonii by a number of small characteristics, especially by having a circular gland and a broken band of maroon above the gland.